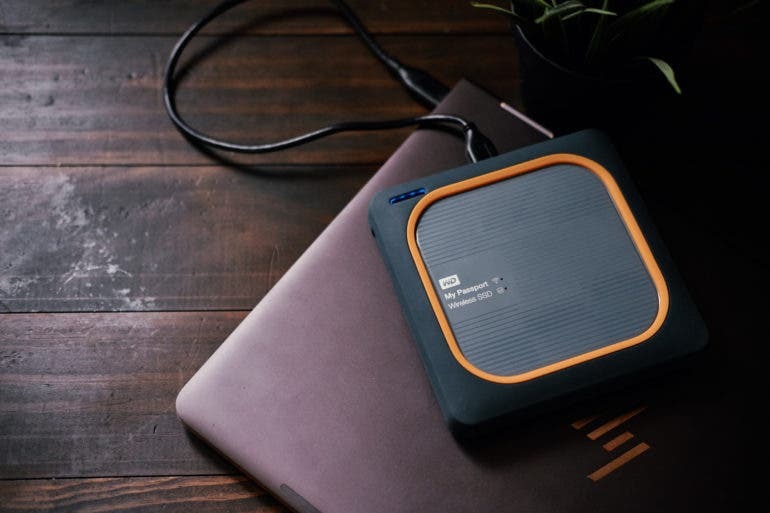 Western Digital, or WD as you may know the company, has been pushing the envelope in terms of external storage solutions for several years now. 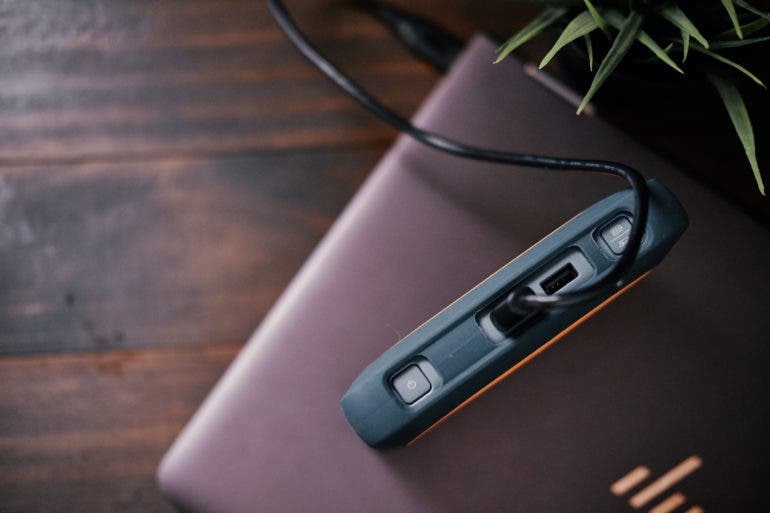 It started with their original My Passport Wireless (read our review) and has gone through a couple of iterations since then, now culminating with their latest offering for the traveling content creator – the My Passport Wireless SSD. 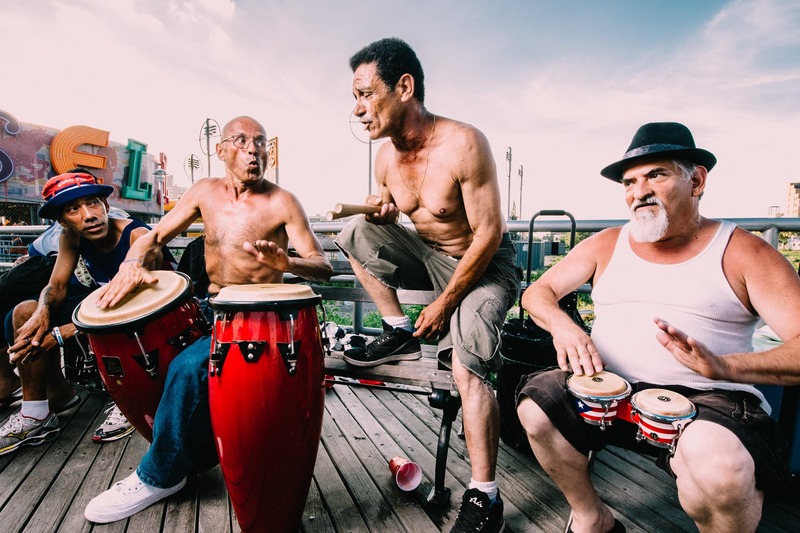 What they are positioning to be is the perfect external drive of the traveling content creator; be that photographer, videographer, whatever. We have had our hands on the drive since it was announced at CES in January, and today we are here with our full review. Over the course of this review, we have traveled by plane, by car and used the My Passport Wireless SSD as it is intended to be used. We have had our hands on the 1TB model, but there are also 2TB models, as well as 250GB and 500GB models. For this review, we utilized the [amazon_textlink asin=’B01F5LVTO4′ text=’WD My Passport Wireless SSD 1TB’ template=’ProductLink’ store=’thephobl-20′ marketplace=’US’ link_id=’da5adc85-1681-11e8-a7dc-b9fbb414c229′] along with a [amazon_textlink asin=’B0766TPHSH’ text=’Google Pixel 2 XL’ template=’ProductLink’ store=’thephobl-20′ marketplace=’US’ link_id=’e1ac2e87-1681-11e8-82e9-691809566dc8′], [amazon_textlink asin=’B0799849GX’ text=’HP Spectre x360 15”’ template=’ProductLink’ store=’thephobl-20′ marketplace=’US’ link_id=’f5166d6d-1681-11e8-8b6f-d3d4b8512bc4′] (early 2017 model), as well as a [amazon_textlink asin=’B01A8DUR74′ text=’Fujifilm X-Pro2′ template=’ProductLink’ store=’thephobl-20′ marketplace=’US’ link_id=’fdd18976-1681-11e8-8ecf-8f60315577ca’] and [amazon_textlink asin=’B016S28I4S’ text=’XF 35mm F2 R WR’ template=’ProductLink’ store=’thephobl-20′ marketplace=’US’ link_id=’053eee81-1682-11e8-a9a0-1d5840ef2886′]. 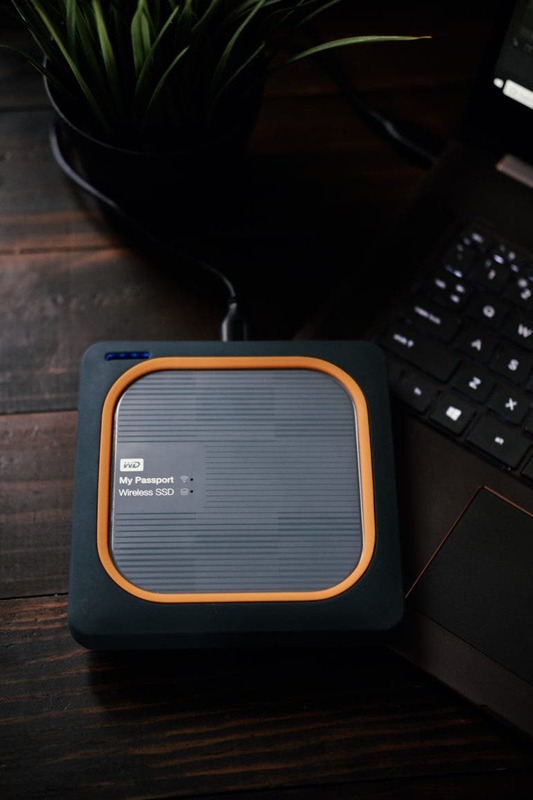 The WD My Passport Wireless SSD for all intents and purposes looks and functions very similar to last year’s WD My Passport Wireless SSD. It retains that same square design with rounded corners and a rubber ‘bumper’ that helps cushion and protect the unit in case of a fall. On the front of the unit you see two indicator lights next to the product branding, one of these indicates the status of the SSD inside and the other indicates the status of the wireless functionality (this light also doubles as the status indicator, flashing when processes are underway). Above that, in the top left corner you will also see four indicator lights which will usually be off when you see them. These are the battery indicator lights, and when you press on the SD/Battery indicator button these will light up to show you how much power the My Passport Wireless SSD has left. On the left side of the unit, you will find a slit in the bumper and access to the SD Card reader. This is the only thing on either the left or right side of the unit. On the top side of the unit is where you will do most of your physical interaction with the My Passport Wireless SSD. This is where you have the power button, SD/Battery indicator button, as well as the two USB 3.0 ports. One is for connecting the unit to a computer or the included wall charger, and the other is for connecting devices to the My Passport Wireless SSD. You can use this port to connect another SD Card reader, or your camera, or a USB stick. As noted above, the Western Digital My Passport Wireless SSD borrows a lot from its My Passport Wireless Pro brother. That includes its excellent build quality, which WD says was designed to withstand falls from up to 1 meter. Besides the rubber bumper, the main casing for the unit is a hard, but rugged plastic which I would put up there with the best that I’ve felt from an external drive not made of metal. There are certainly better built external drives; however most don’t come with the unique functionality the My Passport Wireless SSD comes with, so it’s a bit of a ‘whats more important to you’ dilemma. In our experience, the My Passport Wireless SSD was able to stand up to plenty of abuse. We let a 4 yr old run around and ‘play’ with it; which included banging it on a wall, throwing it, sitting on it, standing on it… just about every imaginable thing the people at WD reading this are probably cringing over. But that said, the unit took the abuse like a champ and still worked flawlessly. So to that end, consider us impressed with the My Passport Wireless SSD in the build quality and ruggedness category. This one is a bit of a mixed bag with the My Passport Wireless SSD to be honest. In terms of connecting to the unit with our phone, and accessing files via the app, we had no problems whatsoever. It was simple to set up, and painless to use. The same can be said for interacting with the unit itself. The SD card import works as expected and the rest of the ports and buttons do as well. But where we ran into our annoyances was with the USB 3 connection to the computer, specifically when trying to directly access the drive via a wired connection to the My Passport Wireless SSD. Simply put, we could not get our computer to recognize the drive with any cable other than the one that came with the drive. As well, we could not get it to connect through any USB hubs or adapters either. So basically, the only way you can connect this to your computer with a wire is if you use the included USB 3 cable (which is somewhat short) and by plugging that directly into a USB 3.0 port. If you try using another cable or try connecting it to a hub of any kind you are likely to run into problems – at least we sure did. That said, once we figured out that annoyance, we were able to test the drive wired to our laptop. The unit performed exactly as expected, and that is to say, well. One area where we did seem to vary from WD on this review was with the longevity of the battery. WD rates the battery life as ‘All Day’ (or ~10 hours) and in our use it seemed to be much less than that. We didn’t time it directly, but we would start running into battery shutdown issues after 7-8 hours with moderate use (transferring files from an SD, accessing files via the wireless). Don’t get us wrong, 7-8 hours is still more than enough for our use cases and is better than many battery powered options out there. But we did need to point out that in our testing we werent ever able to hit the 10 hour mark WD claimed. 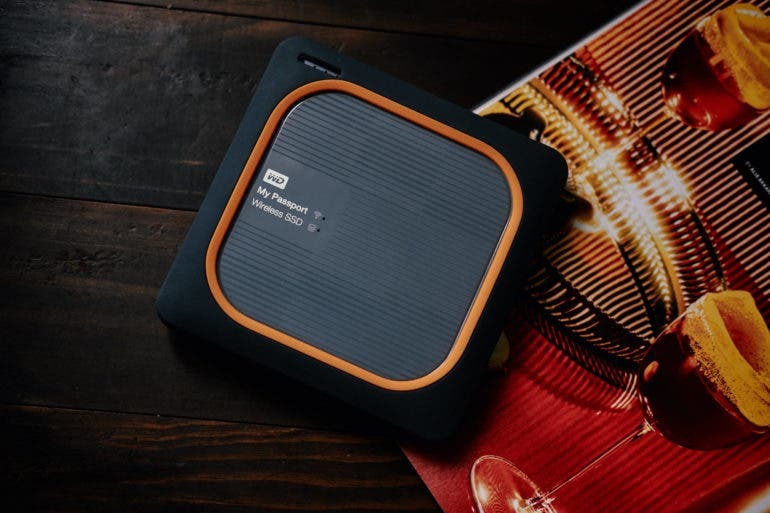 The My Passport Wireless SSD is a unit that we can highly recommend to photographers, videographers, and other creatives who need to backup and access their data while on the go and in locations not conducive to bringing/using a laptop. As well, when you are in those places where you can connect the unit directly to your computer, you will enjoy speeds that blow away any standard external drive that you have been using, likely reaching or exceeding the speed of the drives in your laptop (on the PC side anyway). In our testing we were able to get just over 400 MB/s on the read/write performance with this unit. Now that isn’t as fast as the latest USB 3.1 Gen II based external SSDs, nor the internal NvME based solutions. However, compared to the much slower speeds of hard drives (internal and external) that you are most likely accustomed to in external drives, this will feel like a considerable speed improvement. In fact, if you are using standard 2.5” SSD in your desktop or laptop then this unit will probably not be much slower, if slower at all. So in theory, you may end up with an external drive that offers no speed hit compared to your internal drive(s); and that is the dream, is it not? 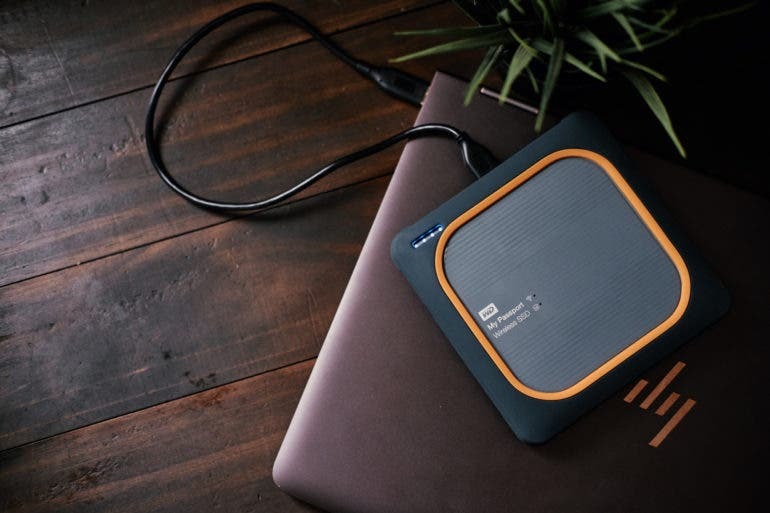 Add to that the rugged build, ability to take a beating, easy access to files via your phone, automatic backup to other cloud services or other WD Cloud products (like one of their My Cloud NAS units for example), and it is really hard to find much to negatively say about the WD unit. The only real question here, in our opinion, is if you really need an external drive with this functionality. You can get cheaper drives if you don’t need one as fast. You can get drives that require a computer if you don’t need the internal battery for when you travel. You can also get faster (much faster) drives if you don’t need the rugged build. Which reminds me; maybe the one thing we wish WD would have included here is a USB C port. This is where all port connections are heading, and even their own external SSD unit already uses a USB C connection. Given the inability to use this unit with anything other than the included cable means that users with computers that only have USB C (or Thunderbolt 3) connections are not going to be able to take full advantage of this drive, nor utilize the drive to its possible full speed potential (thanks to the increased speeds possible with USB 3.1 Gen II and Thunderbolt 3). So that is probably the biggest flaw and oversight here from WD in our opinion. That said, as noted above, we still find this to be an incredibly well built and useful product for those who need one. So that is why we are giving it a 4 out of 5-star rating; fix that USB cable issue so we can connect with different cables or through USB hubs and the WD My Passport Wireless SSD could easily be 5 out of 5 stars. The 1TB model of the WD My Passport Wireless SSD we tested for this review can be found at the time of this review for $599; with other models like the 250GB going for as cheap as $199 and the 2TB model going for as much as $899. Anthony is a Portland, Oregon based Boudoir Photographer specializing in a dark, moody style that promotes female body positivity, empowerment, and sexuality. Besides The Phoblographer, he also reviews gear and produces his own educational content on his website.